Ascuba Venture has a new program for kids ages 7-12, who are interested in SCUBA and the underwater world. It is called Scuba Rangers! The Scuba Rangers are introduced to SCUBA in a pool environment where they learn several of the skills that our Basic Open Water Divers learn. Learning how to scuba dive is no longer limited to the adults! All of our Ranger Classes are taught only by instructors specifically trained in the Rangers program. 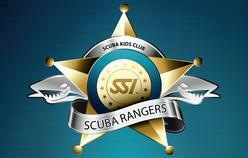 The Scuba Ranger Program is not just a one time class that your child enrolls in. Once they graduate all of the levels for the basic program they can come back and take Ranger Specialties! Numerous specialties are offered such as Night Ranger, Rescue Ranger, Maze Ranger, Shark Ranger, Navigation Ranger, and many, many more. They can even make it to different ranks such as Advanced Ranger and Master Ranger based on how many specialties they have! The Scuba Ranger training is broken into 5 different levels that can be spread out or done in one of our Ranger Camps. 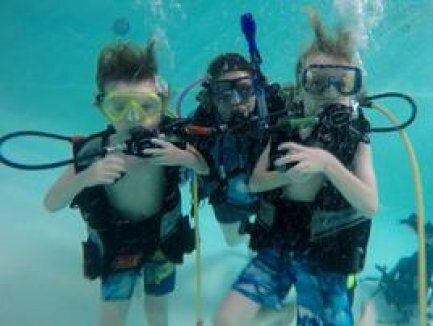 The kids are taught the skills and knowledge they need to become safe and successful divers in a fun yet controlled environment. As your child completes each level they are awarded pieces of gear that will be theirs to keep at the completion of the course. Kids demonstrate their swimming skills and learn how to snorkel with a mask, snorkel and fins. They receive their Ranger kit and their snorkel! Our would be divers are introduced to actual diving equipment. They start learning the basics, what are these things for and how do we use them? Rangers get to go into the pool with equipment for the first time. They receive their dive mask and mouthpieces at this level. Rangers learn new diving exercises in the pool such as how to float in the water. Rangers get fitted and receive their dive suit! Children play games underwater while wearing diving equipment to increase their comfort and practice the diving techniques learned so far. The kids get their fins this session. Your proud children are able to "teach"diving to parents, siblings, and friends by doing demonstrations of the skills they've learned. Now they are able to receive their Ranger ID, T-shirt and membership into the Ranger Club! Scuba Rangers are NOT OPEN WATER CERTIFIED SCUBA DIVERS. The scuba portion of the program is designed to teach and make your Ranger comfortable and safe using scuba under the direct supervision of a Certified Ranger Instructor in a POOL ENVIRONMENT ONLY! !